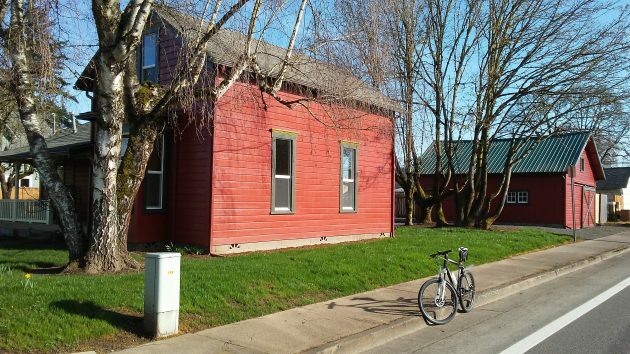 Albany’s Willamette Neighborhood is coming back, and Paul Dykast and others like him are the reason why. They see an old house, dilapidated and maybe covered in vines, and seize the opportunity to make it into an appealing home that is both traditional and new. That’s what Dykast has now accomplished with a house dating from before 1900 at the southeast corner of First Avenue and Geary Street. The place is on one of my bike routes through town, and I’ve watched it being worked on for the last several months as I rode past. This week I saw it was done, gleaming in the afternoon light on a rare sunny day. Dykast, 58, is a farmer, growing grass seed on his place south of Crabtree. Now and then, during the winters when there’s not much to do on the farm, he’s been rebuilding houses in Albany and Lebanon. How many? He’s not sure, but he estimates about 18 to date. 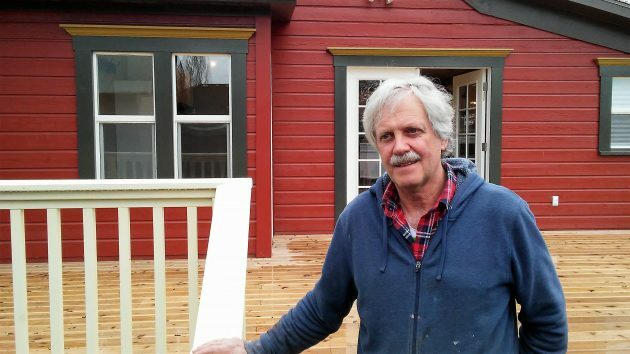 He bought the place at 1804 First Avenue E. in April 2016 for $79,520 plus closing costs. 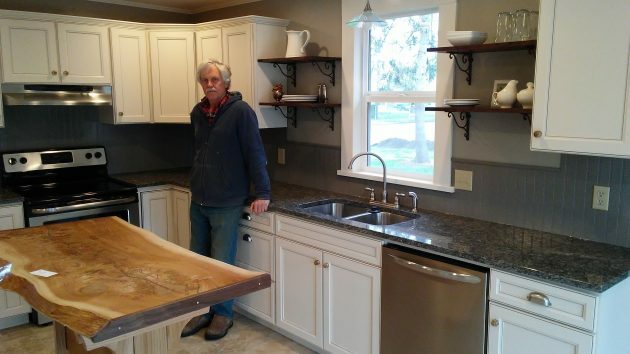 He and his wife, Mitzi, redesigned the interior layout to provide for, among other things, two modern bathrooms, and an indoor laundry and mudroom. In the reconstruction, they took care to save and restore the trim around the doors and windows. They put in modern windows of the same shape as the originals, but they preserved the stained glass in front. Dykast did the reconstruction himself. “Farmers know how to do things,” he told me with a grin. When it was done, they invited the neighbors in for a look around the place, with its three bedrooms, two baths and about 1,600 square feet. Then they posted the property for sale for $205,000. Ten days later, Dykast says, he accepted an offer and got his price. The southeast corner of First and Geary, including a carriage house, has a fresh new look. 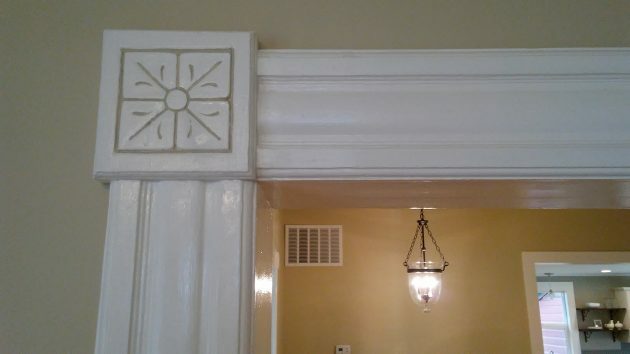 The trim around doors and windows was retained and refurbished. And here’s a look at the bright new kitchen. 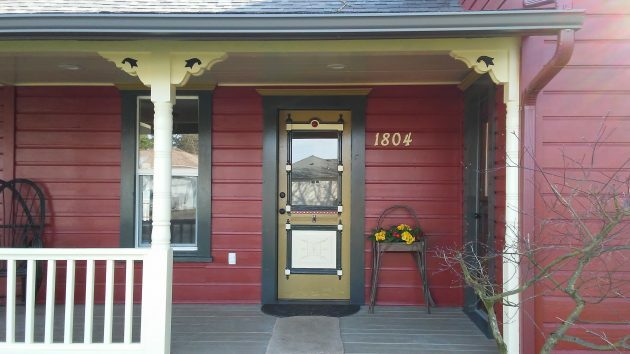 This is the original door and porch trim, restored and with a new coat of paint. What a positive! Just a wonderful thing to do and it turned out beautifully! This is the future of development, or ought to be. Another important element is local landlords with a handful of tenants, living among them. And another: new zoning rules that allow construction “by right” of additional residences on existing occupied lots. I don’t know Mr. Dykast but may he and his tribe of refurbishers grow and flourish. It takes a patient person or team to attempt and complete projects like these and we they succeed it is marvelous. And thank you Mr. Hering for stopping to inquire. Contrast this market capitalist with the crony capitalists who feed at the CARA trough. The crony relies on the coercive power of government to tax. The crony depends on subsidies in the form of grants and forgivable loans. The crony enriches himself and grows his wealth by accepting money not earned. The crony exploits his connections with city hall to obtain city-provided advantage. Legal plunder is their lifeblood. They make money the modern way – hand out and palm up. Case in point – the wealthy developer from Lake Oswego. The next time a crony and CARA jump into bed together, every property tax payer should ask – what would Paul do? True. No government assistance in this project. There always have been and always will be entrepreneurs who have the financial wherewithal and expertise to do their own projects. I applaud them for that — Paul Dykast is a prime example. But to say that we should wait for properties to fall into that state of disrepair before offering assisting is ludicrous IMO. Shows what private enterprise can do. If it was done by government, it would have taken five years, fifty workers, and the selling price would be five hundred thousand.